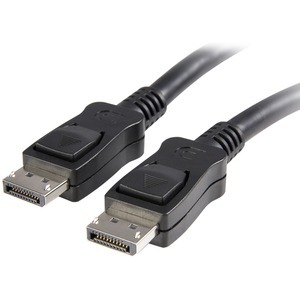 StarTech.com DisplayPort cables are expertly designed to accommodate peak performance and are constructed of top quality materials to ensure optimum reliability. This 15ft DisplayPort cable is HDCP and DPCP capable, ensuring that digitally protected content is displayed properly on the connected display. Each cable features small, USB-sized latching connectors, with support for two-way display connectivity and optional audio support. Plus, DisplayPort cables feature a unique micro-packet architecture that supports new display features as the DisplayPort standard is further developed. Supporting a maximum bandwidth of 10.8 Gbps, DisplayPort is capable of providing higher performance than either HDMI or dual link DVI and supports next generation multimedia applications with a maximum resolution capability of up to WQXGA (2560×1600).